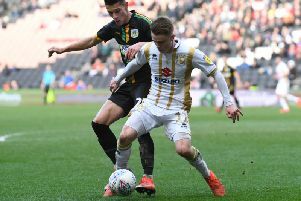 MK Dons will be keen to return to the automatic promotion spots on Saturday when they take on Crewe Alexandra at Stadium MK. Mansfield’s 1-0 win over Crawley Town on Tuesday night saw Dons tumble out of the top three, helped much by their recent wobble in form. Dons have won just one of their last five -the 6-0 demolition of Cambridge United on New Year’s Day - and with the gap to leaders Lincoln City now five points, Paul Tisdale’s side must find their feet again. After losing leads late on against Northampton, Stevenage and Bury recently, Tisdale does not believe his side have a mental block to overcome in terms of the way they see out games, and feels he knows how to solve their recent problems. "I have a very clear picture of what we need to do," he said. "It's not the obvious, just defending. It's a team game, we defend from the front, attack from the back. The players listen really well, they're very receptive. We work hard off the pitch establishing how we think. We know what we have to do, and we'll sort it. There is a lot going right. "I have to look at the big picture. I'm comfortable with what we're doing. I'm bitterly disappointed with losing a lead or two. There are some games I'm more disappointed with than others, because it amounts to different things. Ultimately, we've lost a few points. Generally, we're in a good position but I'd like us to have more. It;s not just the keeper when the ball goes in the net, it's whole team." Crewe visit Stadium MK having picked 10 points from a possible 15, but in a lowly 14th spot. The sides have met 10 times down the years, but the Alex will be eager to forget their last visit, which saw Dons dish out a ruthless 6-1 win, led by Dele Alli’s hat-trick. Crewe in fact have never won in Milton Keynes, their best result a 2-2 draw in 2009. Earlier this season, the sides shared a 0-0 draw at the Alexandra Stadium. Tisdale added: "We've done really well at home but I'm not taking anything for granted," said Tisdale. "Crewe will want an away win. We have to approach every game here as though they will play their best game."